with y's and brown eyes: Happy Birthday Mom! Today is My Mom's birthday. My Dad sent me this photo from the time they had with ds last week. 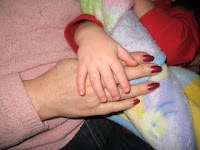 The same gentle hands that held and comforted me are now doing the same for my babies. I am so blessed and thankful to have my Mom near me and my family. Happy Birthday Mom, here's to a wonderful 2009 and many more. I love you.